Healthcare systems globally are reconfiguring to address the needs of people with long-term conditions such as respiratory disease. Primary Care Organisations (PCOs) in England and Wales are charged with the task of developing cost-effective patient-centred local models of care. We aimed to investigate how PCOs in England and Wales are reconfiguring their workforce to develop respiratory services, and the background factors influencing service redesign. Semi-structured qualitative telephone interviews with the person(s) responsible for driving respiratory service reconfiguration in a purposive sample of 30 PCOs. Interviews were recorded, transcribed, coded and thematically analysed. We interviewed representatives of 30 PCOs with diverse demographic profiles planning a range of models of care. Although the primary driver was consistently identified as the need to respond to a central policy to shift the delivery of care for people with long-term conditions into the community whilst achieving financial balance, the design and implementation of services were subject to a broad range of local, and at times serendipitous, influences. The focus was almost exclusively on the complex needs of patients at the top of the long-term conditions (LTC) pyramid, with the aim of reducing admissions. Whilst some PCOs seemed able to develop innovative care despite uncertainty and financial restrictions, most highlighted many barriers to progress, describing initiatives suddenly shelved for lack of money, progress impeded by reluctant clinicians, plans thwarted by conflicting policies and a PCO workforce demoralised by job insecurity. For many of our interviewees there was a large gap between central policy rhetoric driving workforce change, and the practical reality of implementing change within PCOs when faced with the challenges of limited resources, diverse professional attitudes and an uncertain organisational context. Research should concentrate on understanding these complex dynamics in order to inform the policymakers, commissioners, health service managers and professionals. The increasing prevalence of long-term conditions is acknowledged as an important challenge for healthcare services globally. [1, 2] The need to care for those with long-term disease in an ageing population places considerable demands on existing health and social care resources. Respiratory conditions, currently responsible for 7% of deaths in the UK, are predicted to become one of the leading five causes of chronic ill health globally by 2020. Chronic Obstructive Pulmonary Disease (COPD) is responsible for one in eight emergency admissions to hospital,[4, 5] Following two high-profile reports which highlighted the need for personalised, structured and integrated care for people with COPD in order to manage the disease burden more effectively,[5, 6] a National Service Framework (NSF) has been commissioned. Pyramid of care for long-term conditions. (adapted from Improving Chronic Disease Management. ). 'Care Closer to Home' is widely promoted as offering a cost-effective alternative to expensive hospital treatment, with specific initiatives such as Hospital at Home schemes, and GPs with special interests (GPwSIs), seen as important components of intermediate care services integrating primary and secondary care. [2, 5, 7, 10] In England and Wales, PCOs are charged with the responsibility to commission services to implement these policies according to local need. Although reviews of the evidence on diffusion of innovation in the health service,  and summaries of advice on achieving organisational change in the NHS are available,  there is a need to understand how policy is implemented in practice amidst current changes and reorganisations within the NHS. Our study aimed to investigate how PCOs (i.e. Primary Care Trusts in England and Local Health Boards in Wales; freestanding statutory NHS bodies with responsibility for delivering healthcare and health improvements to their local areas) reconfigure their workforce to develop respiratory services and to meet the needs of people with long-term conditions. Our previous work suggested that up to a third of PCOs were considering including GPwSIs in their respiratory service, based on evidence that they can safely provide care for a proportion of patients otherwise referred to secondary care, and that clinical outcomes are similar, with patients often equally or more satisfied with the service. [15–17] Our study, therefore specifically aimed to study the development of a GPwSI-centred service models within the context of other (often nurse-led) models. We here report the first phase of the study in which we explored the context, drivers, barriers and facilitators to respiratory service reconfiguration in a purposefully selected sample of PCOs in England and Wales, representing a broad spectrum of attitudes and levels of development in the reconfiguration of respiratory services. This 'baseline' phase had the dual objective of enabling us to select four PCOs for in-depth case study (to be reported in due course) and also of providing the broad context for further evaluation. This study was undertaken with the ethics approval of the Southeast Multi-Centre Research Ethics Committee and governance approval from all participating PCOs. All participants provided informed consent. We recruited a purposeful sample of PCOs, representing a broad spectrum of potentially relevant factors and influences, including demographic and geographic profile, existing or planned models of community-based respiratory care. As the primary interest of our study was the role of GPwSIs, we specifically sought a number of PCOs with GP or GPwSI involvement in reconfiguring respiratory services. Our initial selection was based on our knowledge of PCOs' intentions from a previous survey, and on expressions of interest received in responses to the publication of the General Practice Airways Group Respiratory GPwSI resource pack. These were supplemented by snowball sampling to identify PCOs reputed to have in place or be planning novel models of care. At the time of the interviews there was a total of 330 PCOs, however we were aware of imminent mergers, which subsequently reduced the number of PCOs to 110. We took this into consideration, when recruiting in order, for example, to avoid overlap where PCOs were already working closely with their prospective partners. We approached PCOs by letter, followed up by a phone call, requesting a 45 minute telephone interview with the person(s) responsible for driving the reconfiguration of respiratory services or, in the case of PCOs not planning reconfiguration of respiratory services, the person responsible for other comparable chronic disease services in the PCO. We planned to recruit until we identified no new models of care and were satisfied we had reached data saturation. Based on our previous work, [13, 20] and our understanding of current policies and discussions relating to the management of long-term conditions, [2, 5–7, 10, 21] we devised a semi-structured interview schedule, collecting data on size and demographics of the PCO, financial and organisational context, the current priorities, preferred model of care for respiratory disease, key drivers, barriers and facilitators (see Additional file 2, Appendix 1 for the full schedule). The topic guide was reviewed by the multi-disciplinary team in an iterative process as the interviews progressed. The interviews were conducted by one researcher (AT) who made extensive field notes on pre-structured forms. Interviews were audio-recorded (apart from interviews 1 and 2 because of technical problems) and fully transcribed. Analysis of the interview data was undertaken by two researchers (SH and HP) using the thematic method described by Zeibland et al. Emergent themes were discussed by all members of the multidisciplinary team during project meetings and workshops. We sent a postal invitation to 110 PCOs between February and June 2006; 40 agreed to consider our request. After gaining permission from line managers, 30 identified a suitable person for an interview. The demographic details, merger and financial status of the PCOs and the professional role of the interviewees are summarised in table 1 (see additional file 1). Within the 30 sampled PCOs, we identified a range of respiratory service models, often including a combination of approaches, with multidisciplinary teams providing a respiratory service. We reached saturation in terms of the service models identified. In summary, we have categorised these models according to the main focus of the model, as described by the interviewee's description. Five were developing, or considering developing, respiratory GPwSI services. Sixteen had, or were developing, a role for community matrons in COPD care. Fifteen were nurse-led models, and a further seven included nurses in multi-disciplinary respiratory teams. Three were developing models incorporating consultants working in the community. Two PCOs were not prioritising respiratory care. The models were in varying stages of development and implementation at the time of the interviews, but the fluidity of the process, and variability between different aspects of reconfiguration within individual PCOs made it impossible to give a meaningful indication of the phase of development. Throughout the interviews, the impact of change emerged as an important theme, which in many cases, was discussed in terms of a positive/negative dichotomy, both driving and impeding development. Reconfiguration of respiratory services was discussed within the context of the changing environment of the NHS in England and Wales, as at the time of the interviews, many of the Primary Care Organisations were merging, and/or undergoing structural reorganisation. Change impacted on all stages of respiratory service development from the initial drivers through the design phase to the implementation. We identified three phases of change and model development (summarised in figure 2): 1) Drivers for change, 2) Designing new models of care, and 3) Implementing change. Summary of the phases of change and model development. Many interviewees described the primary drivers to redevelopment as being central policies, particularly on shifting care into the community, the proactive management of long-term conditions and broadening of professional roles. The impending PCO mergers and commissioner-provider split provided a fluid and uncertain context for these changes. Recognition that change was needed to enhance local patient care was another important driver. Several PCOs were investing time and money in exploring local need with scoping exercises, or audits of service use, and a few were commissioning interviews and focus groups to help them understand the patients' perspective. Some PCOs valued the input of local practitioners as a means of gauging patient needs, though others were concerned that clinical perspectives might not always reflect those of patients. The imperative to achieve financial balance was frequently cited as a driver for change. Budgetary and resource restrictions both drove service redesign by imposing a need for cost saving alternatives to hospital admissions, and acted as a major barrier as plans were shelved to save money. Almost all interviewees spoke of how financial restrictions impacted on the design of respiratory services. In some cases there was insufficient funding to develop a desired service: in others service development proceeded successfully only to have progress (often suddenly) aborted due to removal of funding. Models were often chosen because of their cost saving potential. In some cases these were not the preferred models, however financial restrictions did not allow for the more expensive (yet considered potentially better) model of care. Specifically, a GPwSI service was often rejected as being too expensive in relation to other options. Sometimes the choice of model was dictated by the presence of a funding stream for a specific model of care (for example: charity funding to start up an asthma education project for parents, pharmaceutical company sponsorship for pulmonary rehabilitation, or funding for initiatives to attract GPs to under-doctored areas used to support GPwSI training). Teamwork was an enabler of change and service redesign in those PCOs who used the expertise available in primary and/or secondary care. Although managers and primary and secondary care clinicians could have different visions, alignment of perspectives could enable change. The presence of professional support or opposition was highlighted as an important factor influencing choice of model redesign. Some interviewees described how clinicians from primary or secondary care could actively "champion" preferred models or conversely how opposition (for example from consultants) could mean that certain choices were avoided. Examples were cited where the narrow perspective of a professional had restricted the possibilities of developing new ways of working, and PCOs had subsequently adopted strategies to counterbalance vested interests. More practically, availability of an individual with professional expertise and interest could determine whether a GPwSI or specialist nurse service was selected. Patient views on existing services and proposed redesign were actively sought by some PCOs, usually in the form of satisfaction surveys, though a few were commissioning interviews and focus groups to help them understand the patients' perspective. Local networks also provided opportunities to identify patient perspectives. Decisions about models of care were influenced, both positively and negatively, by previous experience. This could be the personal experience of a person involved in redesign, or the PCO may have had success (or otherwise) with specific models in other long-term condition areas. Many interviewees commented that the chaos and uncertainty associated with the imminent PCO reorganisation acted as a major block to effective development. Instability and lack of job security within PCOs due to the impending reorganisation meant that managerial positions remained vacant causing the planning process to stall. By contrast, however, several interviewees spoke positively of the potential for expanding their successful respiratory services to their future partner PCOs, or spoke optimistically of an opportunity to develop a new service. Careful design and planning did not always ensure successful implementation. Policies, such as 'Payment by Results' (PbR),  could work against the service redesign, causing tension between the acute trust and the PCO. In some cases, service design proceeded successfully only to have a key appointment or initiative stopped (sometimes very suddenly) due to lack of funding. Some interviewees described how implementation of the newly designed changes could be impeded by reluctant members of the healthcare teams, perhaps perceiving the proposed changes as a threat. There was particular emphasis on the need to change the medical culture for the new models to be accepted. Against a backdrop of uncertainty due the impending reorganisation and, in some cases, large financial deficits, the PCOs in our study sought to marshal their resources to develop new services to meet the increasing needs of a population with long-term respiratory conditions. Although the primary driver for this reconfiguration was consistently identified as the central policy to shift care for people with long-term conditions cost-effectively into the community, the design and implementation of new services was subject to a broad range of local and at times serendipitous influences which could, and often did, derail the process. Some interviewees described teams of clinicians and managers able to balance policy requirements and local needs in order to develop innovative care, albeit limited by financial restrictions and often with an uncertain future. Most, however, highlighted the many barriers to progress describing initiatives suddenly shelved for lack of money, progress impeded by reluctant clinicians, plans for reducing hospital care thwarted by 'Payment by Results' and a PCO workforce demoralised by the upheaval and job insecurity of a merger. For many of our interviewees, there was a large gap between policy rhetoric and practical reality. Our participants may not have encompassed the full range of contexts in PCOs in England and Wales, however, we purposefully sampled trusts with a wide geographic and demographic spread and a range of proposed respiratory service models and in an attempt to minimise this risk we continued to recruit until saturation was reached. The 30 PCOs who agreed to participate may have been the most enthusiastic about reconfiguring services, however, our purposive sampling included one PCO with no intention to develop a respiratory service and several with very limited plans. In addition, the models described by the participants echoed those identified by a national survey. Our data are derived from a single interview in each PCO, and although we standardised our requests to PCOs, asking to speak to the person responsible for driving the reconfiguration of respiratory services, some interviewees may not have been fully aware of the situation in their PCO. The interviewees had a range of clinical and/or managerial roles, and we recognise that their answers and perceptions will have reflected their individual perspectives. Interviewees may have omitted to mention some issues, though we used a structured topic guide to ensure that we asked specifically about relevant issues. A major strength of the study is the multidisciplinary expertise (clinical, health service management, anthropological) available within the study team, ensuring balanced conclusions. We continued interviews until we reached saturation with regard to models of care. Although the approach varied, almost all the developments described by our interviewees addressed the complex needs of patients at the top of the LTC pyramid, and focussed predominantly on reducing admissions. [2, 7] Even if predictive models can accurately identify 'at risk' patients,  a narrow focus overlooks the importance of ensuring early diagnosis and strengthening disease management and supported self-care for those at lower levels of the pyramid to prevent progression and future escalation of care needs, [5, 6, 25] and perpetuates some of the limitations of the reactive approach to acute care. Short term planning (often no further than the end of the current financial year), limited resources and the uncertainty of imminent PCO reorganisation were amongst the factors identified by our participants as barriers to developing broader strategies. Our findings resonate with a number of recognised theories of innovation and change management. We observed the described tension between centrally driven innovation and local adoption of 'good ideas', and the paradox that the context, far from being a 'confounder' is integral to the implementation of complex innovation. Our data exemplify the maxim that organisational change is subject to a range of variables which interact to influence outcomes. [11, 40] The crucial significance of 'relative advantage', i.e. the need to identify models which offered advantages to all clinicians and managers who needed to be involved in development, was apparent as healthcare professionals impeded change that they perceived may be disadvantageous. Champions are recognised as key determinants of organisational innovation, echoing our interviewees accounts of how local professionals had successfully championed developments in their PCO. Such theories can provide insight into how the complex dynamics in some PCOs enable change to occur, whilst impeding change in others. Whilst some PCOs seemed able to overcome the challenges of organisational fluidity and financial constraints in order design and implement new services for people with long-term respiratory disease, the resulting services were largely directed at reducing admissions amongst the small number of people with complex needs. 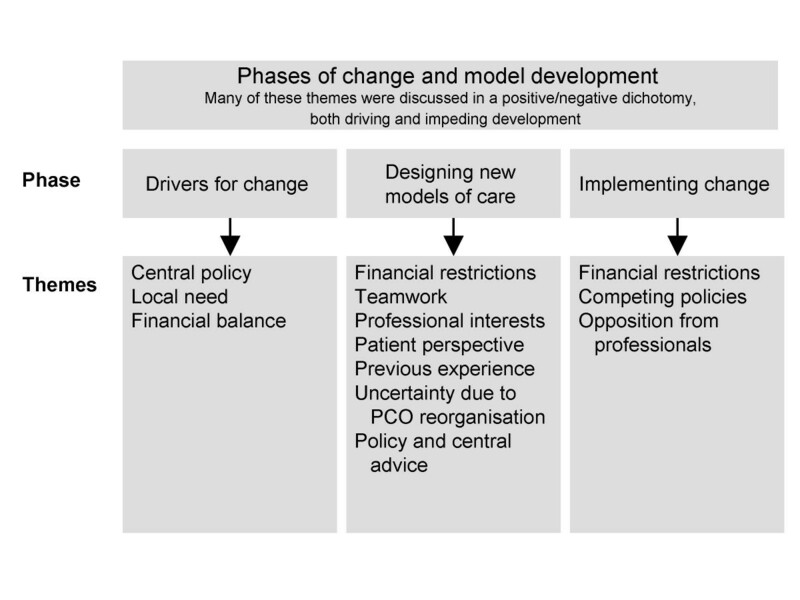 For many PCOs the barriers of financial deficit, organisational uncertainty, disengaged clinicians, and contradictory policies presented insurmountable barriers to the effective development of sustainable services. In other PCOs these barriers were being overcome and new models of care successfully developed, although their sustainability in the shifting organisational context at the time of the study was in question. Research should concentrate on understanding these complex dynamics in order to inform policy-makers, commissioners, health service managers and professionals of effective strategies to implement change. A legal entity formed to provide health services in a secondary care setting. When a patient has a number of long term conditions and complex needs, their care becomes more difficult for them to manage. Case Management is where a named coordinator, e.g. a Community Matron, actively manages care by offering continuity of care, coordination and a personalised care plan for vulnerable people most at risk. General Practitioner Family doctor. Patients in the UK access healthcare through the GP practice with whom they are registered. General Practitioners with a Special Interest. Practising GPs with a special expertise in (respiratory medicine) whose role often includes in service development as well as clinical care. Local Delivery Plan. A 3 yr plan that every PCO prepares and agrees with its Strategic Health Authority (SHA) on how to invest its funds to meet its local and national targets, and improve services. It is a public document which provides an overview of PCO priorities, and how it intends to manage its resources. Long-term conditions. Illnesses which lasts longer than a year, usually degenerative, causing limitations to one's physical, mental and/or social well-being. Symptoms may come and go, and usually there is no cure, but there are things that can be done to maintain or improve the person's quality of life and wellbeing. Long Term Conditions include Diabetes, COPD, Asthma, Arthritis, Epilepsy and Mental Health. 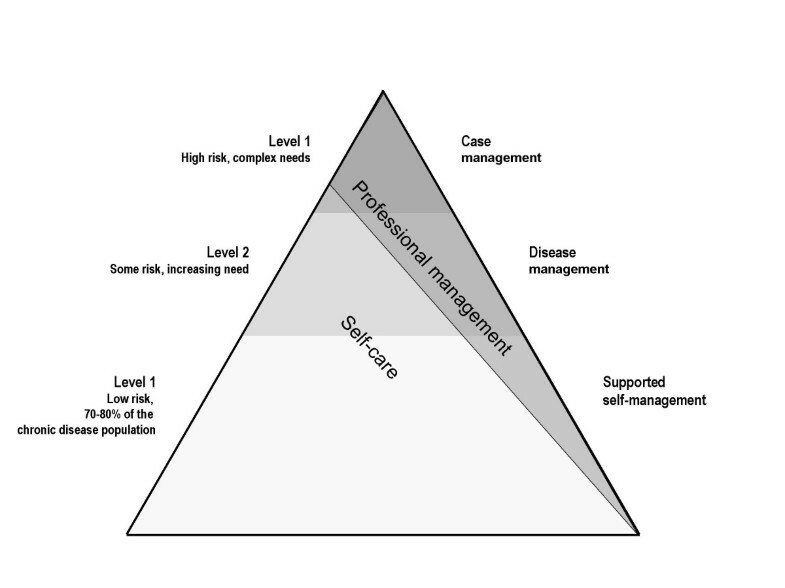 A pyramid with three levels of professional and self-care widely adopted as a model of service provision for people with long-term conditions. It is based on categorising care according to risk stratification. National Health Service. The publicly funded healthcare system in England, Scotland, and Wales. National Service Framework. These NHS documents set national standards for the provision of care for a range of disease areas. Payment by Results. How secondary care providers in England are now paid. There is a national fixed tariff for emergency care, elective in-patients, day cases and outpatients bought by NHS commissioners. The important principle is that only work done and recorded using appropriate coding is paid for. Primary Care Organisation. Freestanding statutory NHS bodies (Primary Care Trust in England; Local Health Boards in Wales) with responsibility for delivering healthcare and health improvements to their local areas. They commission or directly provide a range of community health services such as district nursing as part of their functions. We are grateful to the Independent Steering Committee, Professor Bonnie Sibbald (chairman), John Taylor and Donna Covey, for their invaluable oversight of the project. HP initiated the idea for the study and led the development of the protocol and securing of funding with GH and AS. HP, GH, AT and AS contributed to study administration, data analysis, interpretation of results and writing of the paper. SH undertook the data analysis and wrote the original draft of the paper. All authors reviewed the final manuscript. HP and GH are study guarantors.